Following on from my recent post about the training cups that Lara had been trying out, I was given the opportunity to review the Born Free Training Cup for Mums Like You. 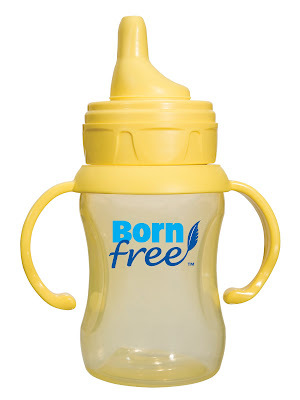 Born Free were pioneers in the campaign for BPA-free feeding bottles and they do great things in terms of educating new mums about feeding problems such as colic; for these reasons I jumped at the opportunity. The Born Free training cup is BPA-free (Bisephenol-A Free) and has an anti-colic vent. It has a semi-soft spout to aid in transition from teat to cup. Initially, I was actually quite surprised at how firm the spout is. Lara loves the spout – she will quite happily sit and chomp on the spout for minutes between sips... it is obviously a good relief for her sore teeth. Thankfully, you can buy spare spouts if your little one chomps through them! The bottle is easily shaped so that I can hold it for Lara if she is that way inclined. It also has an extremely well-shaped set of handles that Lara has no problem gripping on to. The handles can be used with any of Born Free's bottles which would definitely help with the transition from bottle to cup. The vaccum effect valve in the cup is great for ensuring that water doesn't spill everywhere but it is a very low vacuum so that the flow of water is not restricted, and so that your child's drinking action is easy and shouldn't cause ear infections from a harsh sucking motion. I found the Born Free training cup to be easy to clean and to put together/take apart (something that puts me off lots of other bottles and cups). I'm generally happy with this cup but I have noticed that Lara doesn't drink as quickly from this one as her other cups and I suspect that this is because she is soooooo busy using that funky spout as a teether that she forgets to drink up!